Today I am going to talk about the configuration example showing VTP- Virtual Trunking Protocol. 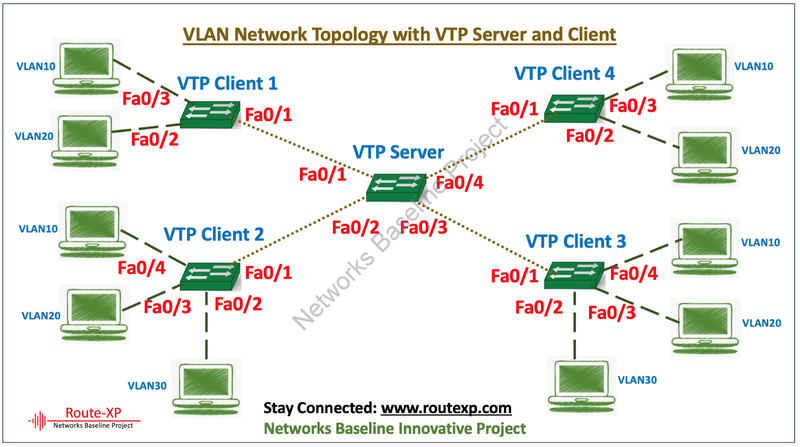 As we know that VTP has 4 modes and these modes are VTP server mode, VTP client mode, VTP transport mode and VTP off mode. VTP Server mode: You can make changes in the VLANs which means you can create, edit and delete the VLANs in the switched network. VTP Client mode: Here the VLAN changes can’t be done and get the update from VTP server mode. VTP transparent mode: In VTP transparent mode, VTP is disabled on the device. The device does not send VTP updates and does not act on VTP updates received from another device. VTP off mode: VTP off mode is the same as VTP transparent mode except that VTP advertisements are not forwarded.